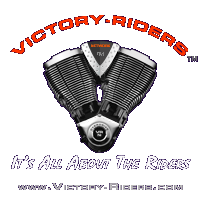 The Victory Riders Network is the online community for Victory Riders. Here we urge you to show off your bike, your rides, and your style. You can create your own local or nationwide groups, start your own blog to share your Victory experience, and build a community of Victory Motorcycle Riders and Enthusiasts. The Victory-Riders Network is all about you, the Riders of The New American Motorcycle. Take it for a spin, make suggestions, enjoy. Read more and make comments here. First THANK YOU! to all those who have used and supported the Victory-Riders Network here on the Ning Social platform. Due to a recent rate increase (150%.. yes you read that correctly) Ning is no longer a cost effective option for our little club. However EVERY attempt will be made to move everything to a new host. In light of finding a new home, if you would take a moment to tell us your favorite feature here on Ning, or a feature you would like to see, please let us know. We'll try to incorporate the most used and requested features into the new platform. Additionally, we are considering combining all of the model specific Riders Sites into a more social environment and would really like to hear your suggestions for features. It has not gone un-noticed that the majority of members on the this Ning platform are from Australia and New Zealand and very few from here use the Victory Riders forums. If there is a particular feature or aspect that has kept you from the forums sites, or kept you on Ning, let us know. We encourage you to check out the Victory Riders sites. While the most popular is the www.Vision-Riders.com site, it is integrated with www.Hammer-Riders.com, www.Vegas-Riders,com , www.Cross-Riders.com and www.Kingpin-Riders.com . Finally, In an effort to assist, please ensure you have backup copies of any photo or video from Ning so you can upload it to the new site if necessary. If you do have backup, deleting photo's or video content that you no longer wish to host here would make it easier for us to migrate to the new site. Again, every attempt will be made to move all content to the new site wherever it may be and as we have to move anyway, we really want to hear your suggestions and comments, what you do and don't like about the current offering so we can hopefully not just move, but also improve. Please email us at webmaster@Victory-Riders.com to send suggestions or comments.